The Piano Sonata No. 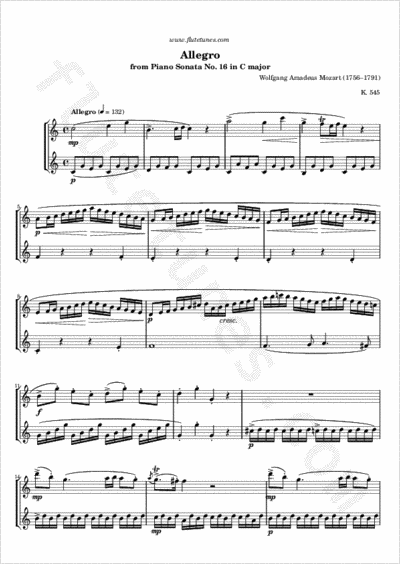 16 in C major, K. 545, by Wolfgang Amadeus Mozart was described by Mozart himself in his own thematic catalogue as “for beginners”, and it is sometimes known by the nickname “Sonata facile” or “Sonata semplice”, which in Italian mean “Easy sonata”. Although the piece is very well known today, it was not published in Mozart's lifetime, first appearing in print in 1805. The relative ease of K. 545 has ensured that it has become the most famous of all Mozart's piano sonatas, a work that scarcely a student of the instrument fails to learn at some point in his or her career. The opening Allegro movement, written in Sonata form, is often quoted as a paradigm of the ambiguity of Classical “simplicity”. The familiar opening theme is accompanied by an Alberti bass, a particular kind of accompaniment often used in the Classical era, consisting of broken chords where the notes of the chord are presented in the order lowest, highest, middle, highest (e.g. C-G-E-G). It was named after Domenico Alberti, who used it extensively, although he was not the first to use it.